Hey everyone! Today's nail art may well be one of my favourite designs I've created. Whilst they're relatively simple, I absolutely loved how they turned out, and OPI - Give Me Space* from the recent OPI Starlight collection made the perfect base for these. It's a gorgeous navy holographic and even the name alone suggests a perfect space manicure! I got the idea for these designs from this design by 'Glitter Fingersss' on Instagram. Lexa is an absolutely amazing artist and there was no way I could recreate her design with such skill, but I tried to make it my own. I was also incredibly rushed when creating these, I had around 20 minutes which just wasn't enough time so they're not as perfect as I would like. I would definitely have liked to perfect the alien a bit more. Nevertheless, for the time I created them in I'm really happy with the outcome. 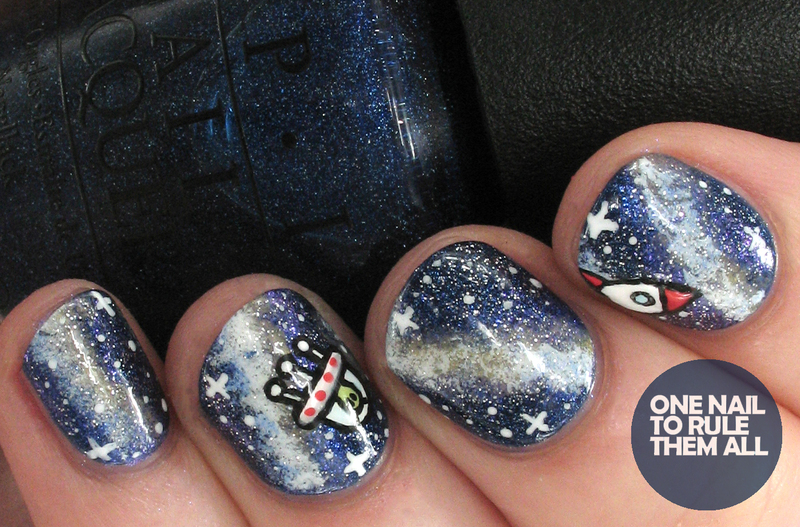 I've also included swatches of Give Me Space after the jump so you can see the full beauty of the polish. For the base I used OPI - Give Me Space*, and then I used Barry M - Supersonic (which is the shimmery purple you can see), plus Barry M - Cotton and Mavala - Lemon Cream for the galaxy. I then added OPI - Pirouette My Whistle over the top to give it some extra glitter, and drew on stars using Barry M - Cotton. The details were done using black acrylic paint, Barry M - Cotton, Barry M - Copa Cobana (red), Mavala - Pistachio (green for the alien), Barry M - Sky Blue (for the rocket window and shading behind the alien), and Barry M - Chai (grey for shading + the moon). All finished off with a coat of Seche Vite. Considering I wrote none of those colours down and I did these two weeks ago, I'm really impressed that I managed to remember all these colours! 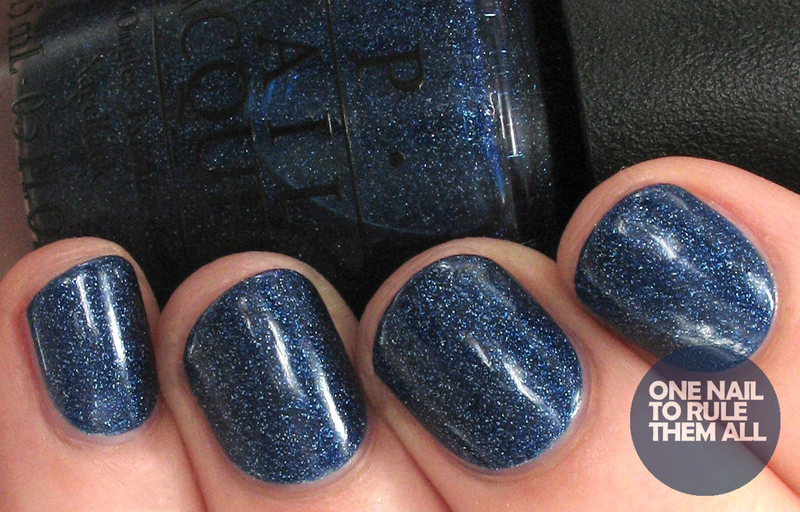 And here's my swatch of OPI - Give Me Space*, which is a beautiful navy holographic. I didn't expect it to be quite as gorgeous from how it looks in the bottle, but it really stands out on the nail and my pictures definitely don't do it justice. This is two very easy coats, which dried very quickly, without topcoat. Love it! I find it beautiful and classy. This is something worth trying out! These look so COOOOOOLLL. I'd love someone to do this for me. 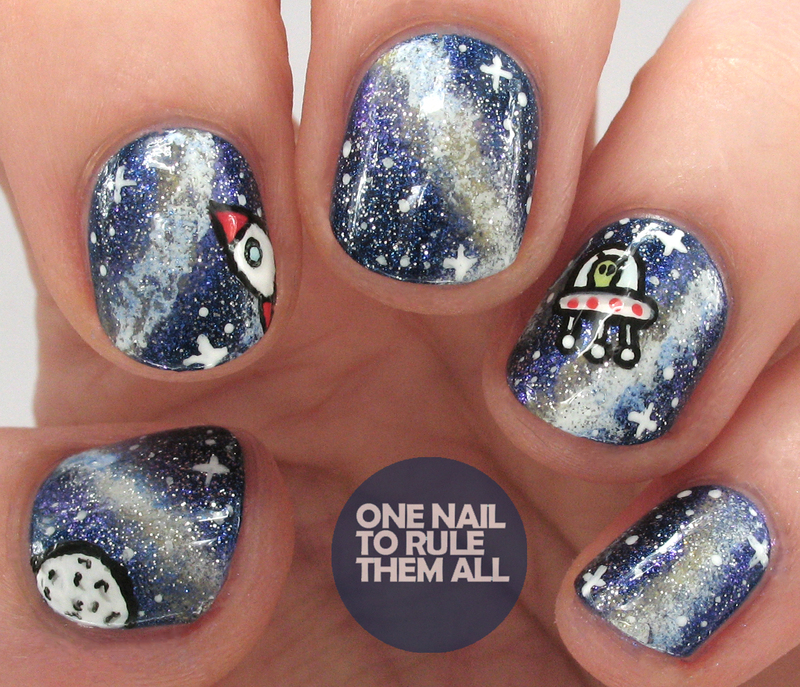 Spacey nails for the win. 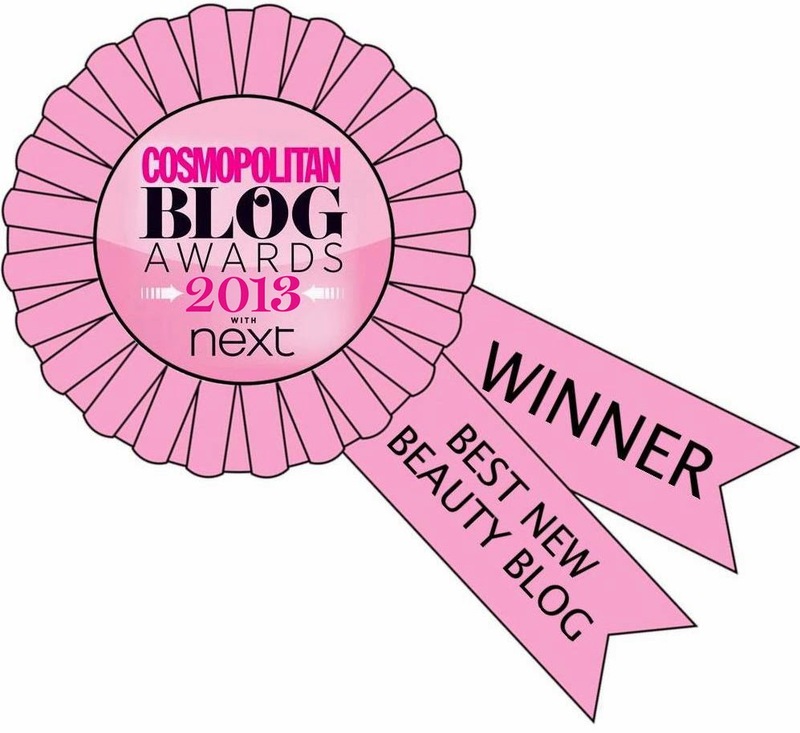 I'm loving the little flying saucer!